Donations from three Erie organizations helped fund new equipment to be used in Production Services at the Barber National Institute. A Yale forklift truck was purchased with a donation of $15,000 from Erie Insurance, $3,700 from the Siebenbuerger Club and $200 from Welch's. The new forklift is used to transport and package assembly jobs completed for regional businesses by adults with disabilities at the Barber National Institute. The donations were made as part of the $1,000,000 Challenge held in commemoration of the 100th birthday of founder Dr. Gertrude Barber. 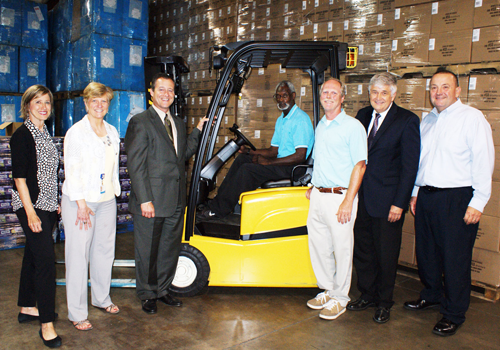 Pictured: Alonzo Arrington, seated in the forklift, shows the new equipment to Erie Insurance administrators, from left, Mary Ita Power, vice president of the Change Management Center of Excellence; Ann Scott, vice president of Community Outreach; and Randy Peterman, Senior Vice President of Financial Planning and Analysis; as well as John Crandall, vice president of the board of directors of the Siebenbuerger Club; and Barber National Institute vice president for advancement Gary Bukowski, CFRE, and department manager Paul Causgrove.